There's only one place which provides a completely natural and undisturbed environment, a rural atmosphere, native flora and fauna just minutes from a heritage town - and that's Bluestone Bay. On the Southern Coast, Port FairyA luxury residence in a natural environment for you, your friends and your family. At Bluestone Bay a 'room with a view' means soft rural landscapes or seascapes, some quiet and tranquil, sometimes restless and wild. 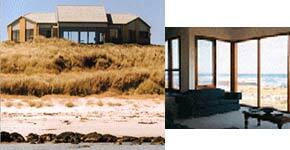 Bluestone Bay is designed to comfortably accommodate two families or up to ten friends. Come and enjoy the luxury of gazing out to sea or relaxing in the spa. Have a BBQ in the sheltered courtyard or cook a feast for your friends in the state-of-the-art kitchen. Laze the day away on the beach in the sun or take a stroll and discover the mysteries of the ocean.